SS Galway Castle is torpedoed and sunk one hundred sixty miles from Fastnet out in the Atlantic. At least twenty-seven are killed. Nursing Sister Constance Addison (South African Military Nursing Service) is killed when she gives up her place in a lifeboat to another passenger. She goes down with the ship. She has two brothers who have been previously killed in the Great War. Major Arthur George Percival Heywood (Manchester Regiment) is killed in action. He is the son of ‘Sir’ Arthur Percival Heywood the Baronet. Second Lieutenant Duncan Francis Charles Adamson (London Regiment) is killed in action at age 21. His father died of wounds received in action as a CQMS in the London Regiment in May 1915. 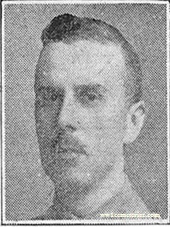 Second Lieutenant Merton Alfred Rose MC (Royal Warwickshire Regiment) dies of wounds at age 24. His brother will die of disease in Egypt in September 1919 on service. Rifleman Thomas Mitchell Abernethy (New Zealand Rifle Brigade) is killed in action at age 27. He is the son of the Reverend Christopher Abernethy and his brother was killed in August 1917. Rifleman Frederick William Farrant (King’s Royal Rifle Corps) is killed in action at age 18. His brother died of wounds in November 1916. Private Alfred Cecil Callister (Army Service Corps) dies at home. His brother was killed in April 1918.